Pennsylvania Magician Eddy Ray has been astounding people from the U.S.A. to the far reaches of Japan with his incredible and artistic sleight of hand, hilarious interactive audience segments, and his fresh approach to performing magic and illusion. Eddy has won numerous awards including 4th place at the Tropicana Hotel & Casino in Las Vegas, Nevada. He was selected to compete at Talent Rock, which was founded by music impresario and entrepreneur Lou Pearlman. In 2008 & 2009 Eddy Ray was asked to audition for America’s Got Talent on NBC. Eddy also is an accomplished author with two magic books available for sale worldwide. He also is the star of over 10 best selling magic instructional DVD’s designed to teach other magicians sleight of hand magic and techniques. Eddy also starred in and produced his own television series called “Magic Town” along with making appearances on other television and radio shows across the country performing his unique blend of magic and illusion. Eddy has performed in every venue imaginable and continues to entertain corporate and public audiences worldwide. 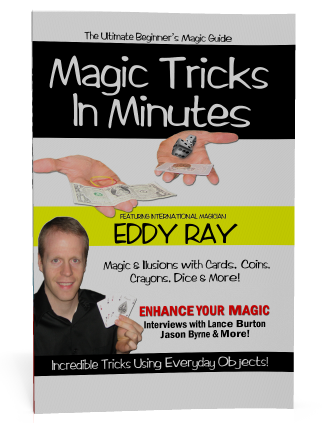 Why Eddy Ray’s Magic Programs? In addition to all of the workshops and assembly programs, Pennsylvania Magician Eddy Ray also offers his family friendly FUN magic show. Eddy Ray’s YouTube Channel has over 100,000 views!